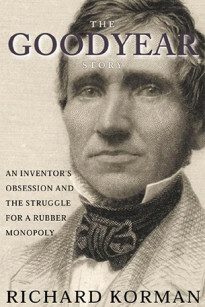 RICHARD KORMAN‘s 2002 biography, The Goodyear Story: An Inventor’s Obsession and the Struggle for a Rubber Monopoly, was picked by the Library Journal as one of the year’s best business-related books. Korman’s career has included podcasts, ghostwriting for Dr. Ruth Westheimer and a CD called Write to Influence, about improving everything from emails to essays. In 2007 he won another American Business Media Jesse H. Neal award for ENR.com, where he is senior business editor and writes the blog/online column Kormantary. His freelance writing has appeared in the New York Times and Business Week, among other publications. Last year the American Society of Business Press Editors placed one of his stories in a book entitled Journalism That Matters. He has appeared on numerous radio and television broadcasts and lectured on CSPAN about Charles Goodyear and America’s technological awakening. Although for public health reasons he only plays in private, Korman claims to be the loudest rock’n’roll piano player ever. “You can hear me in Westchester,” he says. That’s all the way across the Hudson River from Piermont, N.Y., where Korman lives with his daughter, Natalie, and son, David.